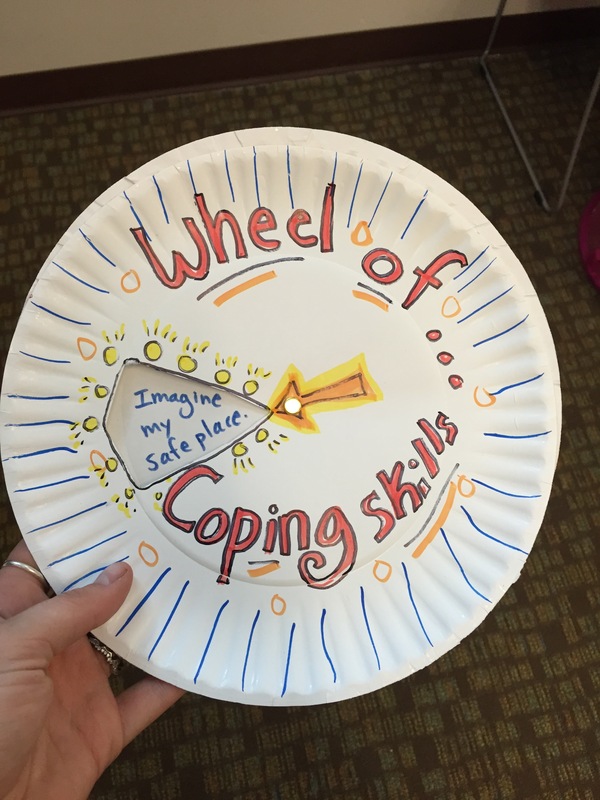 Spin the wheel of coping skills! A big part of what we do with children is teach them safe and appropriate ways to cope and express themselves. We aren’t born knowing how to walk and we also aren’t born knowing how to deal with our emotions, solve problems, or handle disappointments. We learn to walk by someone holding our hands and guiding the process. We learn to calm ourselves as our parents hold, rock, soothe, and eventually teach us ways to calm ourselves on our own. I encourage the children I work with to identify multiple coping and expression skills that work for them personally in various situations. The more they have in their toolbox that personally work for them the better. This is one fun way to help children remember the skills that they have identified and realize that they have a choice of which skill to use in each situation. For example, walking outside may help with frustrations at home but cannot be done at school so another skill needs to be used instead, such as taking deep breaths or imagining a safe place. 1) Take two paper plates and cut out a small triangle towards the middle of one plate. 2) spin the plate and write the skills in each section of the second plate that is exposed in the section that was cut out. 3) insert a paper fastener so the plate can spin and reveal the skills. 4) decorate any way you like! These work great to have available in a calm down area or in a coping skill box at home or in the classroom. Another fun way to use the wheel is to act out social situations with puppets or role plays and use the wheel to choose which skill to use given the situation. This helps children learn to choose skills that best suit the setting and get more practice using them! I love this! 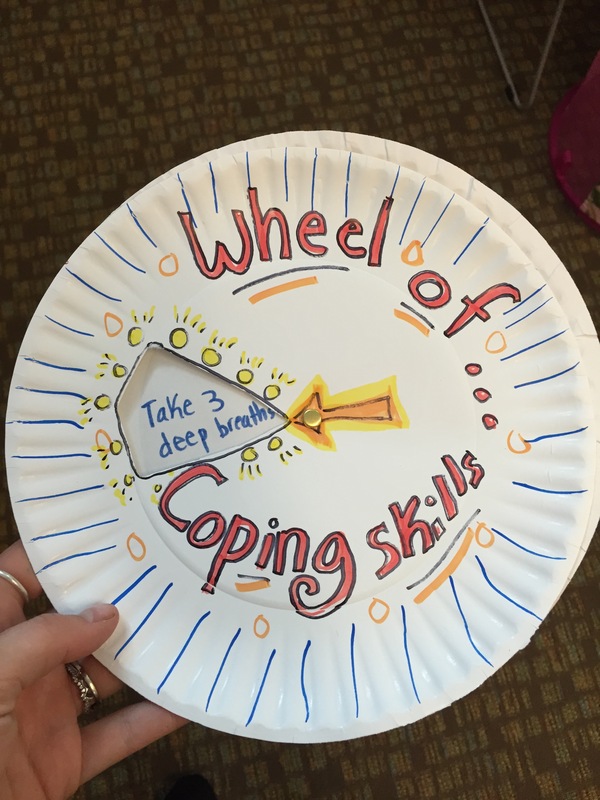 We have one that is just one paper plate with a spinner, sort of like “Wheel of fortune!” I want to try this one because it’s so COOL that the skills are hidden. I did this with my kiddo today. She is normally a clam, but she was a willing participant in doing this skill. Thank you! That makes perfect sense because when a child (or adult) is escalated past the reasoning stage a completely different part of the brain takes over. The key is practicing these skills again and again when your child is not angry. Pretending to be angry then trying the skill is great in role plays or by using puppets. Then engaging her in using coping skills, when possible, before she reaches this “red zone” will help immensely. You need to practice, talk about or play games with children regular with these skills when they are calm. That way they become a natural response when they are in their brain stem or heading that way. For example, breathing before transitioning or starting a new activity. That way it just becomes second nature to relax and get closure to be closer to their frontal lobe when starting something new or during an activity to help them regain or keep composure. Exactly. This activity is also done when children are calm. This activity can also be adjusted to help children notice their very early warning signs to escalation to practice using skills more proactively as well. Fabulous. Out of interest as a social worker, what were the coping list you put on this wheel for a child? Good question! I wonder about Velcro? This would remove the spinning component but could lift and change for different skills chosen maybe? I’ve seen the two pieces of a snap used to connect two plates. (the kind sewn into clothing). What are suggested coping skills? It depends on the child. Different skills work for different children. Deep breathing, imagining a safe place, counting to ten, walking away, feeling a small piece of soft material, thinking of a positive affirmation are just a few. what skills do you write in?? We need concrete ideas. Thank you. Hi Maggy, it depends on the child. It could be anything from deep breathing, to imagining your safe place, thinking of a positive affirmation, counting to ten, walking away, etc. Some children have their own ideas that work specifically for them in their circumstances. Asking the child about a time he or she self soothed and how that worked for home or her can shed some light on a skill that may be a helpful to further emphasize and encourage. my kiddos made these last week and had a great time doing so. For some reason when they are finished and they spin the plates they do not stay aligned? Did you experience this? I have at times. I noticed making the cutout on the top plate first was helpful to then fill in the coping skills on the second plate. I hope that makes sense! Ideas for the wheel: blowing bubbles, listening to Mozart For Children or ocean/nature sounds on a portable DVD player, manipulating clay or play dough, drawing/coloring.